Your night will begin promptly at the designated meet up spot outside of the first ultra lounge on the tour. Inside your professional host will go over your itinerary, drink specials and the professional mixologists will get you started with the first round of signature cocktails. Next your host will lead the party to the ultimate Vegas party bus. Once you board this enormous nightclub on wheels your host will keep the party going until you reach the next destination. 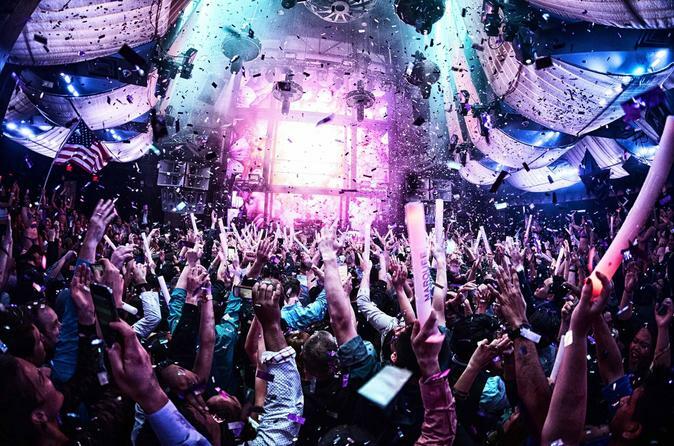 The next stop will be a legendary Las Vegas nightclub featuring premium entertainment and world class DJ's. Your host will lead you to our special designated VIP entrance and you'll skip the line. Inside you'll continue to experience VIP treatment and take part in even more drink specials. Next you will jump back on the party bus en route to another popular night club. Your host will keep action in full swing along the way. You'll receive the same VIP treatment and skip the long lines and enjoy even more drink specials. The final leg of your experience will have you climb in a luxury limousine that will take you to a premium adult entertainment venue.The ultimate nightlife experience in Sin City without the hassle! Tours feature 4 to 5 venues, buy-one-get-one free cocktails, VIP entrance/skipping the long line, a limousine to the largest adult venue in the nation, and a professional host to guide and take care of your party.